Hanabishi partners with GMA Kapuso Foundation (GMAKF) for the Rebuild Marawi Project, an initiative that aims to build and restore eighteen classrooms in three elementary schools located at the heart of Marawi City. Hanabishi will donate P500,000 worth of electric fans, water dispensers and other appliances to beneficiary schools Pendolonan Elementary School, Camp Bagong Amai Pakpak Elementary School and Datu Saber Elementary School. “Hanabishi has always been dedicated to making life better and easier for every Filipino family by offering only the best quality, affordable products. We believe that this vision of helping fellow Filipinos is aligned with the cause of GMAKF and we are very happy that Hanabishi continues to be part of their advocacy by being their partner for many years now,” shared Hanabishi President Jasper Ong. Hanabishi first worked with GMAKF on a housing project for the victims of Typhoon Sendong back in 2011. Since then, Hanabishi has continued to support other GMAFK initiatives, which led to a strong partnership now spanning seven years. GMAKF’s Executive Vice-President and Chief Operating Officer Rikki Catibog noted her appreciation for the support and goodwill Hanabishi had shared with the foundation. “I think the GMA Kapuso Foundation effectively brings the Hanabishi brand to areas where they are needed the most. A great example would be the beneficiary elementary schools of the Rebuild Marawi Project. We cannot stress how important it is for the children to have classrooms that are conducive to learning. We are very thankful that Hanabishi has always been willing to extend whatever help they can in improving the lives of more Filipinos,” said Catibog. GMAKF’s Founder and Ambassador Mel Tiangco also shared her appreciation for the efforts extended by the leading home appliance brand. “Indeed, our partnership with Hanabishi has come a long way, and this wouldn’t have been possible without our shared passion to serve the Filipino people. As our partnership continues to grow, I also wish for Hanabishi’s continued growth and prosperity to enable them to realize their vision and reach out to even more people,” shared Tiangco. 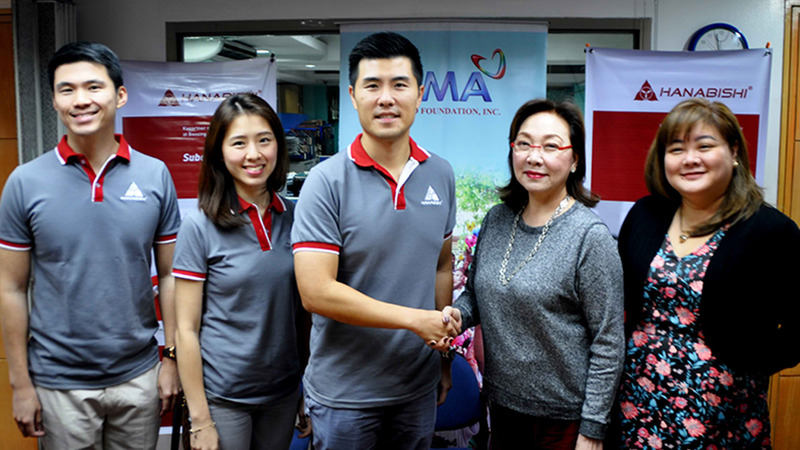 Over the course of its seven-year partnership with GMAKF, Hanabishi has donated appliance sets for 200 houses in Iligan and 600 houses in Tacloban and Leyte, appliances for the Kapuso Village Integrate School in Tacloban and P1 million worth of appliances for the communities ravaged by Typhoon Yolanda. The three schools included in the Rebuild Marawi Project are among the recipients of the 100 classroom target of GMAKF’s Kulayan ang Kinabukasan initiative, which is also supported by Hanabishi.